All Whole Foods Markets will save some trees on Earth Day. In honor of the day Whole Foods will not “bag” up your purchases. It will be Zero Bag Day at Whole Foods. Bring in your own reusable bags! And at their table (behind the customer service booth) sample a planet earth cookie. When: Earth Day – Friday, April 22nd – From 4pm to 7pm. Earth Day on the Bay celebration at the Marine Science Institute is this Saturday April 16 from 8:00 am to 5:00 pm. This free family friendly event will feature programs with tide pool animals, sharks, fish, plankton, along with fish and shark feedings. Touch a crab, fish, eel or snail. There also will be an exploration of Hawaiian ocean culture, an environmental information fair, arts & crafts, and more. Full Circle Farm’s annual Earth Day Festival this Sunday, April 17 from 10:00 am to 3:00 pm. An Earth Day celebration of all things fun, vibrant, and fiercely local here in Silicon Valley; this free festival features local food, local musicians, fun and games for all ages, tours of the Farm, and kids activities including: face painting, petting zoo, seed creations, veggie stamping, flower power bookmarks, and more. Coastal Cleanup Day is 9/25/2010! Last years about this time, I wrote a post recommending that everybody take part in Coastal Cleanup and now it’s rolled around again. From 9:00AM to 5:00PM on Saturday (9/25), people will get down to creeks and waterways around the bay area and clean up the mess! Not sure where to go? Here’s a list of the sites that are being cleaned up today and the condition of the location. You can make a difference, so pick a spot and get down there! But first, you’ll need to be prepared. Bring your own gloves, sturdy shoes, sunscreen, a hat and some water (in a recycled bottle please!) and pitch in. You’ll also need to download and sign a waiver to participate, and it’s a good idea to visit the volunteer page for instructions. In addition, look carefully at the site you’re going to be visiting. We took our 9 year old son with us last year and worked on the Guadalupe Creek cleanup crew. We thought it would be a good way to re-enforce our lessons in taking care of the earth and it was, just not exactly as we planned. See the Guadalupe has a lot of homeless camps along it’s banks and running into the debris left behind as well as cache’s of the residents’ belongings created a whole new lesson in humanity. Encountering needles and the filth in some of the places we found was actually hazardous. I’m not one to shirk away from doing what needs to be done, but think about what your kids can ruin into down there and prepare them to not disturb someone’s camp, pick up needles etc. I’m not saying you shouldn’t take kids to cleanup at all. What I AM saying is be prepared and keep an eye on your kids. Pick a site and go cleanup our waterways! Posted in Environment | Comments Off on Coastal Cleanup Day is 9/25/2010! The Tech Museum of Innovation is hosting an educational forum presented by the Silicon Valley Education Foundation. Solar power will an important part of our energy use in the future. Join Alana Conner (VP of Content Development – The Tech Museum), Charles Weis (County Superintendent of Schools), and Tom Werner (CEO SunPower) to discover how education will help you, or your children enjoy a career in the solar energy field. Note: This event is free and lunch is provided. Visit: Silicon Valley Education Foundation . My downtown neighbor Deborah just posted this great pop/rap video protesting the handling of the recent BP disaster and other massive spill created by offshore oil drilling. That’s Deborah singing lead. She’s joined by AshEL Seasunz for rap vocals. If you upload a photo of yourself holding a hand-written sign saying “Clean Up the Mess. Start Building Our New Green Economy” to the Drill, Baby, … Still? Facebook page, you may appear in the next version of the video. Posted in Environment, Online | Comments Off on Drill, Baby, … Still? 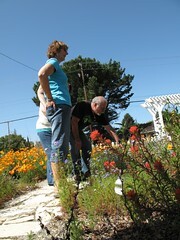 Tour-goers exploring a California native plant garden in south San Jose. Every year I’ve been on the Going Native Garden Tour, I’ve explored the California native plant gardens of a different part of the South Bay. One year it was Santa Clara and Sunnyvale. Another year, the San Jose downtown core. This year I headed for Los Gatos and San Jose’s Camden and Cambrian areas. In the Los Gatos hills (actually in Monte Sereno) I saw a grand, 1.7 acre garden, established for 12 years, where a hillside of poppies and blue-eyed grass frame a view across a small valley. Near downtown Los Gatos was a showpiece home garden by designer Alrie Middlebrook, as well as a community volunteer-planted garden at the Art Museum of Los Gatos, also designed by Middlebrook. Both the Los Gatos garden and one I saw in central southern San Jose were planted on more modest lots. These gardens are on a scale that any homeowner could replicate, saving water and still presenting a beautiful front yard to the neighborhood. Finally, along Capitancillos Drive in a south San Jose neighborhood, volunteers have planted over a half mile of parkstrip bordering the Capitancillos Meadow with a variety of California native plants, including ceanothus (California lilac), bush lupines, buckwheats, and more. This garden is completely unirrigated, but still makes an attractive and impressive border for the road edging this upscale neighborhood. 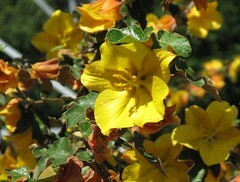 My discovery of the day was flannel bush (aka Fremontodendron), a striking tall shrub, with dramatic yellow flowers and dark green foliage. I saw this both at the Monte Sereno hillside garden and on Capitancillos Drive. I only wish I had enough room in my own garden to fit in one of these dramatic plants. Flannel bush at the Capitancillos Drive parkstrip garden. We’ve mentioned it before, but I thought this would be a good time for a last minute reminder about this Sunday’s Going Native Garden Tour. The tour features dozens of gardens all over Santa Clara County. 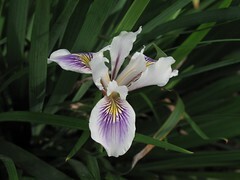 All of the gardens emphasize native California plants, and most are low-water, low-chemical, and beautiful too. You can still register to join the tour until 3 pm on Sunday (or until the tour reaches capacity). All the details are at the tour website. Earth Day celebration at the Marine Science Institute is this Saturday April 17 from 8:00 AM to 5:00 PM. This free family friendly event will feature programs with tide pool animals, sharks, fish, plankton, along with fish and shark feedings. There also will be an exploration of Hawaiian ocean culture, an environmental information fair, and more. A special screening of the new documentary Saving the Bay, with director Ron Blatman (10:00 AM & 3:00 PM ). Full Circle Farm’s Third Annual Earth Day Festival this Sunday, April 18 from 10:00 AM to 2:00 PM. An Earth Day celebration of all things fun, vibrant, and fiercely local here in Silicon Valley; this free festival features local food, local musicians, fun and games for all ages, petting zoo, tours of the Farm (showing off over 100 new fruit trees), and lots of great information from local organizations on how to enjoy the pleasures of a life lived simply and locally.